Gone are the days of a Bali vacay being synonymous with Bintang, fake Havaianas and bad decisions (although, let’s be real, we’re always down for some fun decisions). 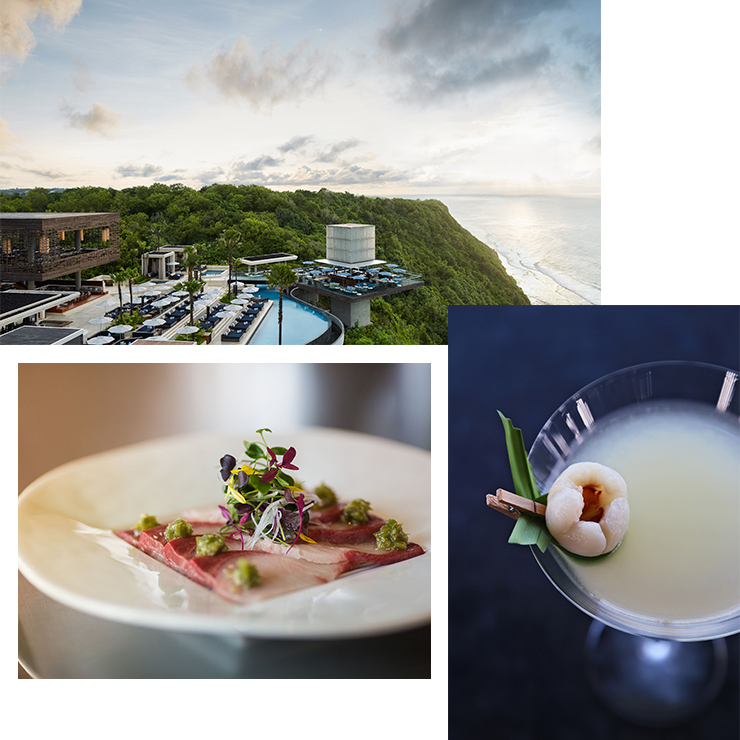 Bali in 2018 is experiencing a culinary renaissance of sorts, making it all sorts of delicious and a go-to locale for serious foodies. London’s Sake No Hana is the newest kid on the block (or should that be cliff? ), hailing all the way from Mayfair (fancy, we know). Nestled on the cliffs of Uluwatu and overlooking the Instaworthy AF Indian Ocean, Sake No Hana’s fit-out needs to be seen to be believed. With that said, it’ll come as no surprise that on a recent trip to Bali it was smack bang at the top of my (embarrassingly long) list of must-try (and taste) new openings. The first thing you’ll notice is that Sake No Hana is located inside the brand-new OMNIA day club which, my friends, is a very good thing (read: excellent). Once you’ve picked your jaw up off the floor, you’re ready to ascend the Grand Staircase to have it drop all over again—here, every single table is blessed with open-air views. This is group dining at its best, and my hot tip would be to let your server do the ordering for you. Let’s be real; you’re on holiday, decisions are hard, and the entire menu is damn delicious. This deliciousness is in large part due to Chef Hideki Hiwatashi, direct from their original London outlet, and with Michelin Star experience. With a group of four hungry ladies (#girlstrip) we brought a whole new meaning to the term feed me and proceeded to work our way through the menu from top to bottom. For starters, the agenasu gomamiso, or eggplant with fresh grape and roasted seasame miso sauce will convert even the most passionate carnivore, and the tuna tartare or maguro caviar tartare topped with tobiko (that’s flying fish eggs FYI), is exactly as decadent as it sounds. Sake No Hana is Japanese food at its finest which means you can’t go past a solid order of sushi and sashimi for the table (obvi, when it comes to ordering, you do you, but we strongly recommend opting for a selection of rolls from their roll menu). With tasty morsels like spicy maguri maki, soft shell crab maki finished with cucumber and mango, and aburi salmon (cue drooling) finished with king crab, tobiko and nashi pear, we’re willing to bet we won’t need to twist your arm when it comes to having a sushi feast. As for the cocktails, the list is so decadent there’d be no judgement from us if you embarked on your own cocktail degustation. Continuing with Bali’s fun in the sun vibe you’ll want to wrap your laughing gear around the cucumber and ginger spritz—think Aperol, ginger juice, cucumber, soda and prosecco all mashed together in a classy AF Chardonnay glass. Now, obviously there is a dessert menu. Let’s be real, you’re going to at least order one dish, grab a spoon, then call your server over to order one more. Let me save you the hassle. The bamboo of mandarin, white chocolate and sesame mousse is a definite yes, and the pear and popcorn pannacotta with sweet corn and soya caramel ice cream will have everyone digging in. Sake No Hana, with one of the best views in Uluwatu, is the perfect It’s-Vacay-And-Imma-Treat-Myself locale.